- supply to finished mile warehouse. Chalk (mile stone), fractions 0-300 mm is brought from open-cut mining by means of dumping trucks (or other types of transport) to covered storehouse and dumped to the raw material stock. From raw material stock chalk is supplied to plate feeder receiving bin. Pit chalk by plate feeder is headed to jaw crusher. 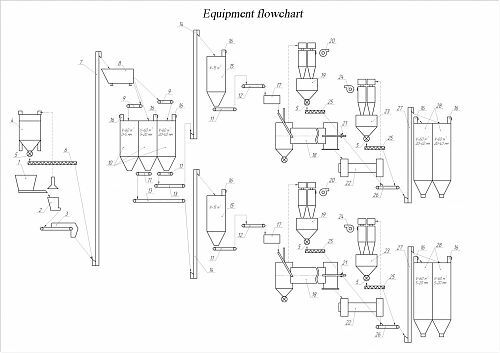 Crushed chalk, fractions 0-50 mm by belt conveyor is transported by conveyor to unbalanced-throw screen on which it is dispersing in to three fractions 5-20 mm, 20-40 mm, and less than 5 mm. Fractions 5-20 mm and 20-40 mm are supplied separately to two intermediate hoppers wherefrom by means of transporting equipment are supplied to raw material preheaters wherein they are heated and through transfer chambers go for firing into the rotating furnaces. Fraction less than 5 mm is not suitable for firing in the rotating furnace and therefore goes to wastes hopper. Lime firing is performed in a short furnace equipped with the heater behind the furnace. After firing, lime goes for cooling in the drum cooler and then by transporting equipment to the finished products warehouse. Deposited dust from furnace chambers and cooler as well as from dust and gas cleaning systems collectors by means of screw conveyors is supplied to finished material conveyor. Delivery of finished products is provided to automobile and railway transport.